It is often said that Sherlock Holmes, the legendary detective created by Arthur Conan Doyle, has made the most on-screen appearances in the history of cinema by a human fictional character (though he still runs second in total appearances to Dracula). I am not going to flat-out say that “Holmes & Watson,” the latest big screen vehicle for the character that finds him being played by Will Ferrell and John C. Reilly as his aide, Dr. John Watson, is so bad that it could bring his seemingly endless streak of movie appearances to a definitive halt. But if any film could possess that power, this is the one. "Holmes & Watson" is so excruciatingly awful that you have to wonder what it was, other than their paychecks, that could have possessed the cast and crew to keep coming back each day, when it must have been obvious from the first day of shooting that the project was the most hopeless of cases imaginable. 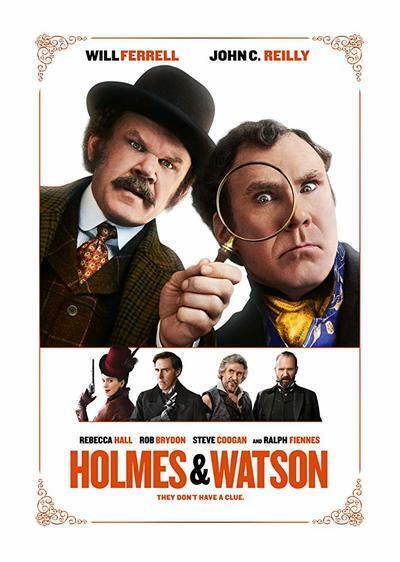 As you may have surmised from the presence of Ferrell and Reilly in the cast, the film is a comedic (at least technically) look at Holmes and his extraordinary deductive skills, an approach that filmmakers have been utilizing for almost as long as they have been bringing the character to the big screen. Some of these films have been quite good—Billy Wilder’s flawed but ambitious “The Private Life of Sherlock Holmes” and the brilliant but shamefully little-seen cult classic “Zero Effect”—and some of them, such as Gene Wilder’s “The Adventures of Sherlock Holmes’ Smarter Brother” and the Michael Caine romp “Without a Clue,” have been quite dreadful. In all of those cases, good or bad, the filmmakers each had some kind of discernible comedic notion they were trying to put forth. With this film, it seems as if once Ferrell and Reilly were cast, all the other creative work was brought to a halt on the assumption that the co-stars of “Talladega Nights: The Legend of Ricky Bobby” and “Step Brothers” would bring enough comedic juice to the proceedings to keep it moving. Based on the available evidence here, all that they actually managed to bring between them was several gallons of flop sweat. It is telling, for example, that the funniest bit in the film comes right at the start and does not involve either of its two ostensible stars. In it, we see the young Sherlock Holmes being mercilessly teased by his classmates at boarding school and using his keen intellect to figure out the bad things that they have done and get them expelled—before long, he is the only student left for his teachers to focus on and his intelligence grows exponentially as a result. This scene works because it is obvious that writer/director Etan Cohen had an idea for a comedic bit—what would the world’s greatest mind do in childhood when faced with bullies?—and pursues it to a decent punchline. At that point in the film, some viewers may be deluded into thinking that "Holmes & Watson" might have promise after all, only to have those hopes shattered a few moments later when the stars arrive and it all goes to hell. This version of Holmes, having recently proven in court that arch-villain Moriarty (Ralph Fiennes) was not guilty of the crime that he was accused of committing, is hired by Buckingham Palace to uncover a plot to kill Queen Victoria (Pam Ferris) in four days time by someone who may or may not be the fiend. The biggest problem here isn’t that this plot is idiotic at best and virtually non-existent the rest of the time. It isn’t the fact that the jokes on display run the gamut from deeply unfunny toilet humor (including a long and wheezy bit where the guys try to come up with euphemisms for masturbation in a courtroom) to equally dopey anachronisms such as Watson’s attempt to use an old-time camera to take a selfie with the Queen. It isn’t even the sense throughout that what we are watching is little more than a series of improv attempts that started off badly and never gained steam. No, the biggest problem is that the film cannot make up its mind as to whether Holmes is a genius of stunning proportions who happens to be a goof, or a vain and pompous idiot whose reputation as a crime-solving mastermind is largely thanks to the behind-the-scenes efforts of Watson. Most comedic Holmes films choose one of the two approaches and go from there, but “Holmes & Watson” switches between them in virtually every scene. This haphazard approach may have worked if the jokes were funny, but the whole thing feels like someone took the unfunny outtakes that might have adorned the end credits and stretched them out into their own film. Considering that the end result is probably the biggest cinematic clunker of the season, the closest thing to an actual mystery in “Holmes & Watson” is how a screenplay as puerile as this one could attract so many talented people. Besides Ferrell, Reilly and Fiennes, the film also includes the usually reliable Rebecca Hall and Kelly Macdonald in the most insultingly conceived roles of their careers, Hugh Laurie in a flop bit as Holmes’ brother, and even Steve Coogan and Rob Brydon, co-stars of the hilarious “The Trip” films, as, respectively, a one-armed tattooist and Inspector Lestrade—like the stars, they all embarrass themselves mightily throughout. I guess there is a possible bright side to all of this: maybe Coogan and Brydon carpooled together and decided to film themselves on their daily journeys to produce this ultimately failed enterprise. If such a film existed, there is a decent chance that it could actually inspire the big laughs that “Holmes & Watson” is so clearly clueless about.